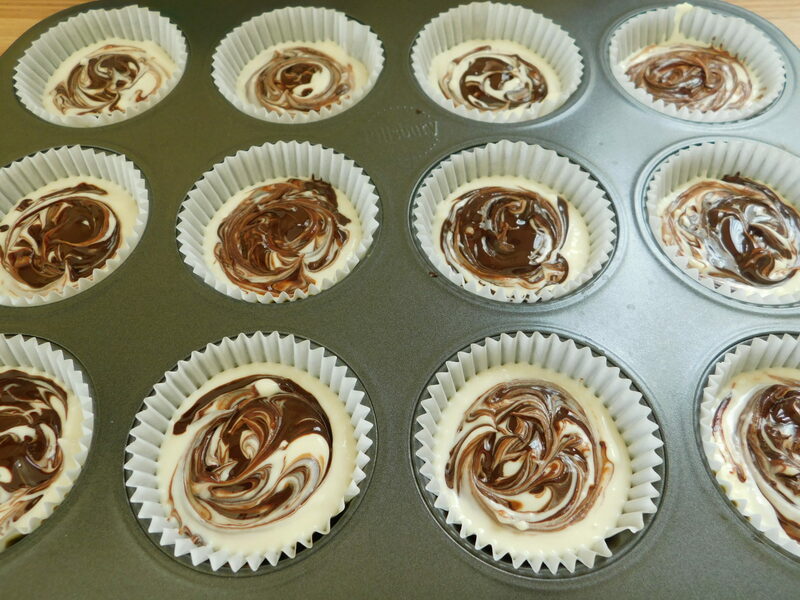 Chocolate swirl oreo cheesecakes - Drizzle Me Skinny!Drizzle Me Skinny! 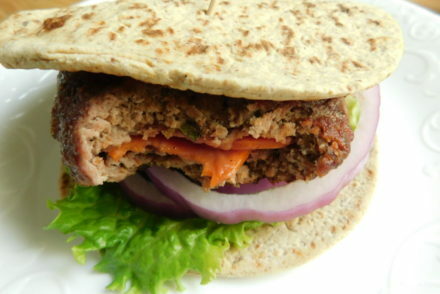 I get a lot of requests to try and make a decadent recipe more Weight Watcher friendly, and I love a good challenge. 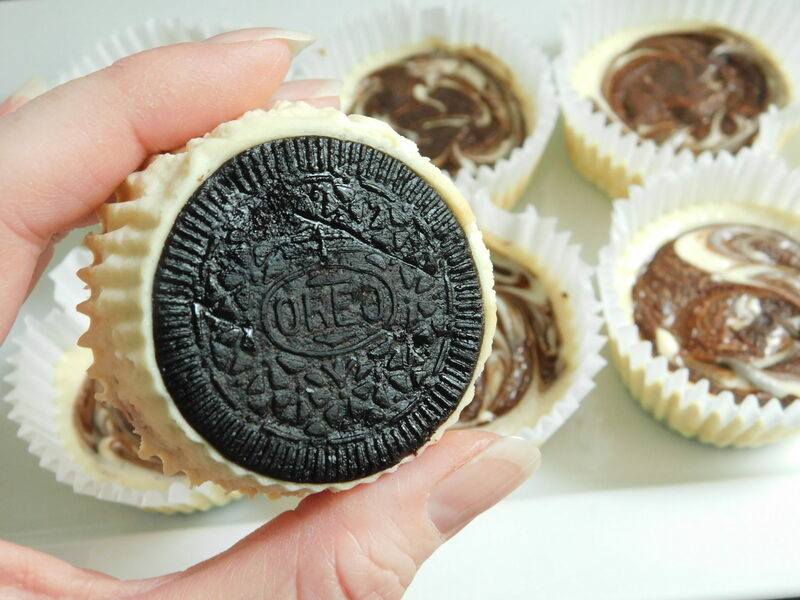 One of my Facebook followers asked if I could “drizzle me skinny” these oreo cheesecake cups she found on the internet. I have several lightened up cheesecake recipes so I was confident I could make them and keep them point friendly. The end result was these delicious chocolate swirl oreo cheesecakes and they were a big hit in my house and did not last long at all. They would make a great Easter dessert and at only 4 smart points each you can enjoy one while staying on track. If you have a request feel free to send me an email [email protected] I’ll do my best to make it WW friendly. 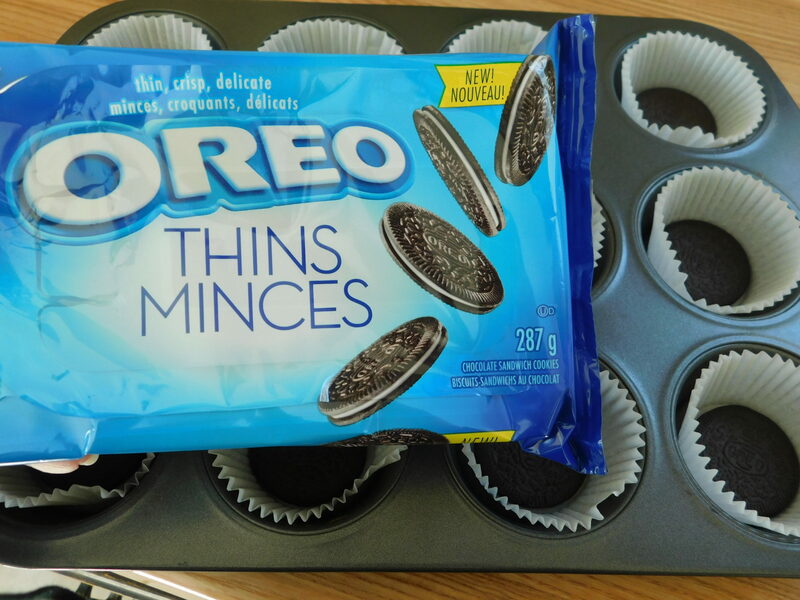 Preheat oven to 325F, place 12 paper cup liners in a 12 hole regular size muffin tin and place 1 oreo thin on the bottom of each. In a bowl using an electric mixer beat together your cream cheese, yogurt, sugar, flour, butter, egg and milk until smooth and creamy. 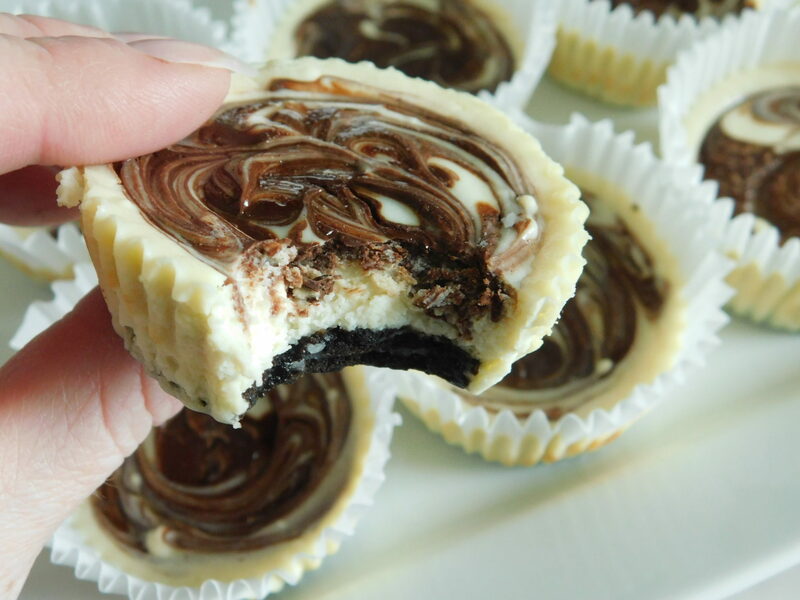 Divide cream cheese mixture into your 12 oreo cups. 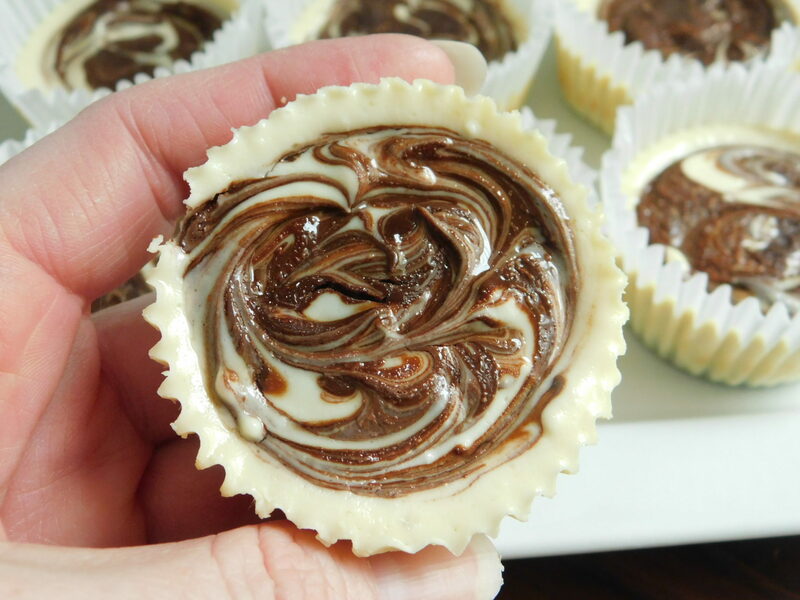 Melt chocolate in the microwave, I find 30-second intervals turning after each works best. 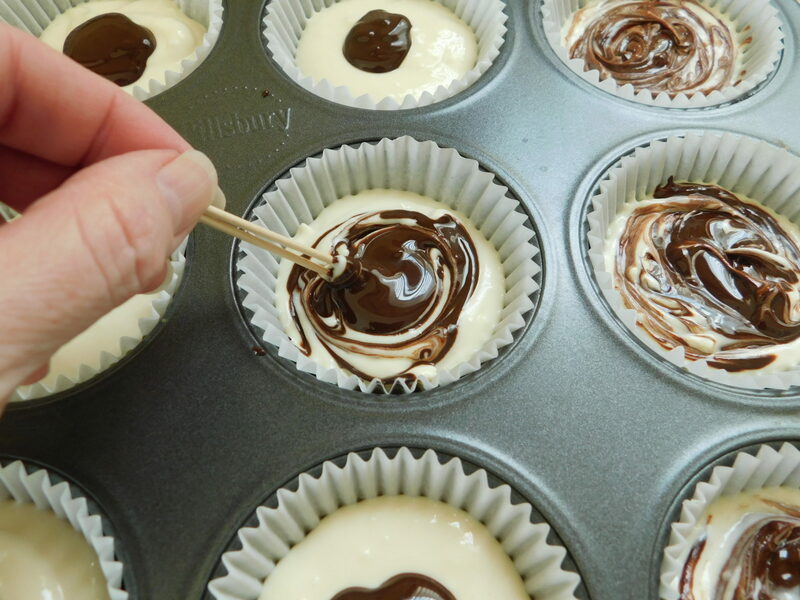 Drop a small amount of melted chooclate into the middle of each cheesecake, then use toothpicks to make a swirl effect. 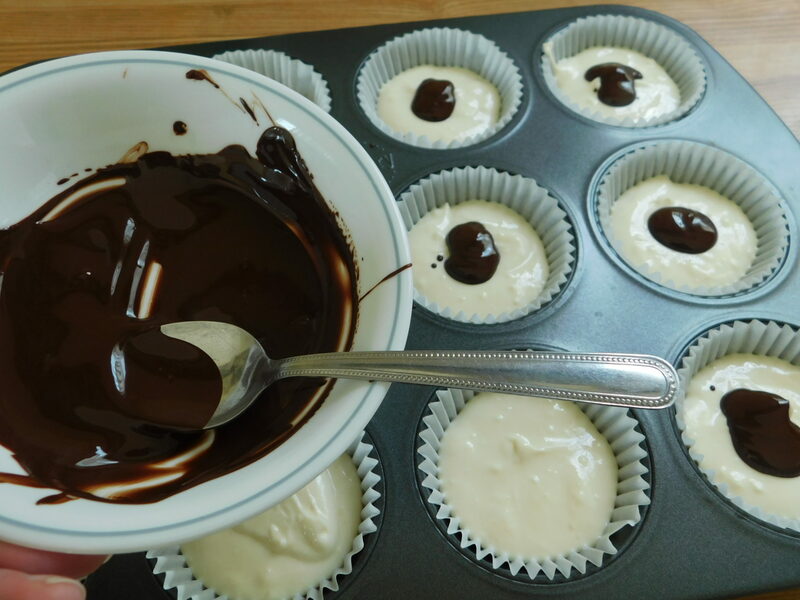 Bake cheesecakes for 25 minutes. Let cool completely, then chill in the fridge for at least 1-2 hours, the longer you chill them the easier they will come out of the paper liners, mine was actually in the fridge overnight, so this can easily be prepped the night before serving. You are so creative with the recipes 👍🏼❤️ I am obsessed with your blog! Thank you so much for creating and sharing! These look amazing…What can we make with the Thin Lemon? They are my favorite!!! I just was thinking the same thing but was thinking of swirling raspberries into the cheesecake mixture! These were so much better than I was expecting!!! 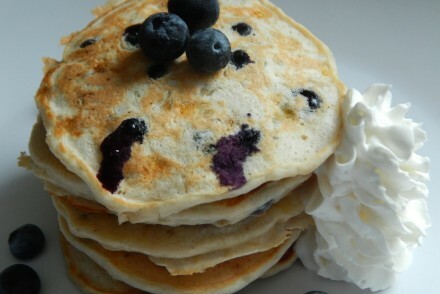 I’ll definitely be using the filling recipe again and tweaking it by using fruit. Love this!!!! Thanks so much! I can’t wait to try this recipe. 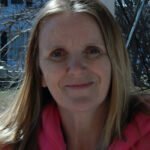 Just saw this new to your blog. You got my attention with chocolate/cheesecake. Who can resist. Between you and Skinny Kitchen I can’t keep up! 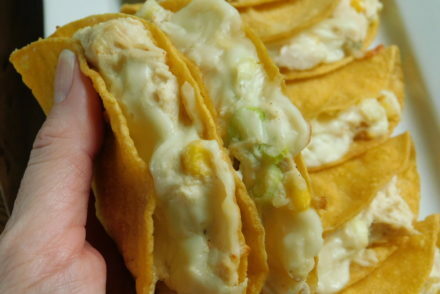 Hope to make these very soon. Thanks to all you do for us. I was wondering if you could use Stevia in place of the sugar and also use skim milk instead of 1% milk. That would lower the points more for me. How much yoghurt is half s cup sorry if this sounds stupid just unsure what size cup to use. Just wanted to let you know that you are positively saving our lives on this WW journey with your sweet treat recipes! My husband is so grateful. Thank you so much for all you do!! We love your recipes!! I have these little gems cooling right now-taking them to a party tonight. That way I ensure I can have dessert. I agree with all the comments; appreciate your creativity with recipes, trying them with lemon and sugar free raspberry jam middles. I love having so many options for my day to day as well as bringing to gatherings. Everyone loves the goodies I bring. I made these last night and enjoyed one after refrigerating overnight. It was very good! It satisfies my yen for cheesecake and the Oreo crust is so rich. It felt decadent and I really miss that. I check in often and look forward to trying other things like that carrot cake loaf. Thanks! Hi these look awesome! I wondered though how many per serving? Please say more then 1!! Lol thanks! OMG these were incredible. I can’t stop thinking about them. They were soooo easy! Thank you for making Weight Watchers so much easier! 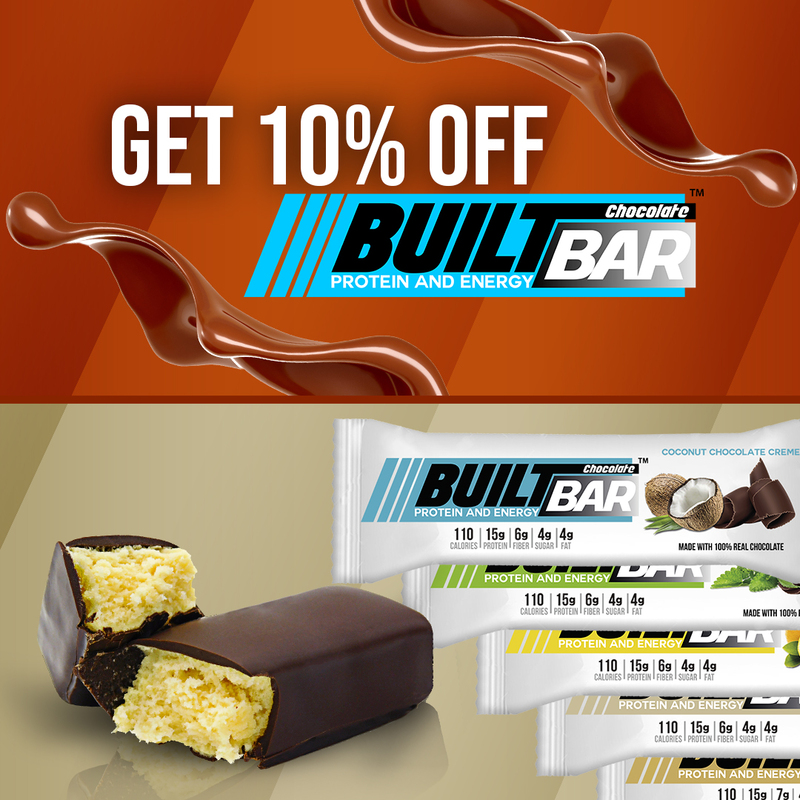 Is the chocolate that you use baking chocolate or regular candy bar chocolate? I made these and they taste good but the bottom is a little wet, what did I do wrong?